In time for bike month, dandy photographer Yvonne Bambrick is showing a series of photographs taken in Toronto alleyways (what better place to bike?) and capturing all the natural and man-made textures you can find there. 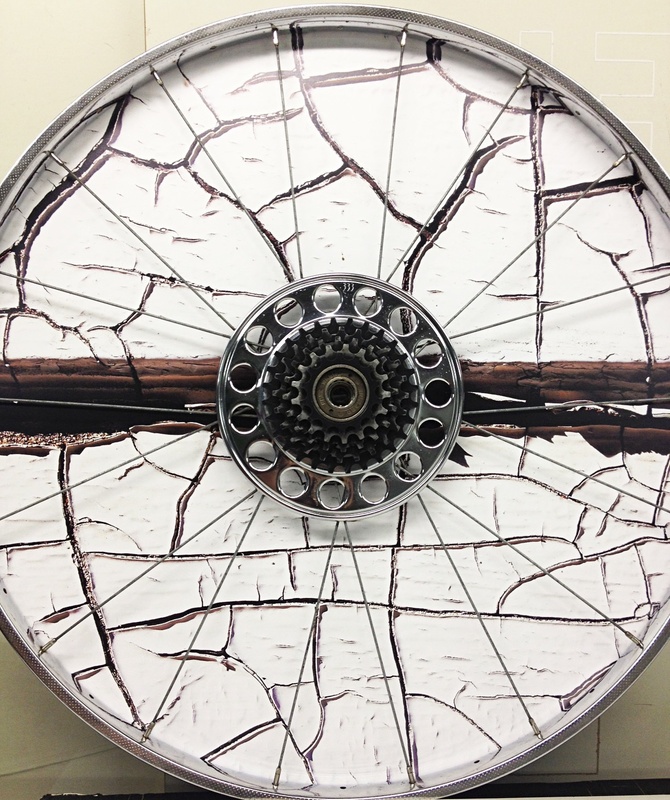 For the project – her first ever solo photo show – Bambrick made frames out of recycled bicycle wheels. Bambrick, former founding director of Toronto Cyclists Union, is also currently working on writing a handbook for urban cyclists to help fill in the gap in cycling education. What do you like most about biking? Being on my own predictable schedule, burning my meals as fuel, and not being stuck in transit/auto traffic! Also, it's mostly a really fun way to travel. How did you get the idea to do this exhibit and how long have you been working on these photographs? I've had the idea in mind for a couple years, but it wasn't until this winter that I had the time to pursue the concept and figure out how to make it work. I've been working on pulling it all together since February. Where did you find all the wheels? The wheels were sourced from several downtown bike shops. Sweet Pete's was a huge help, as were Bikes On Wheels, Bike Pirates and Urbane Cyclist. Did you experience any challenges working with wheels as frames? 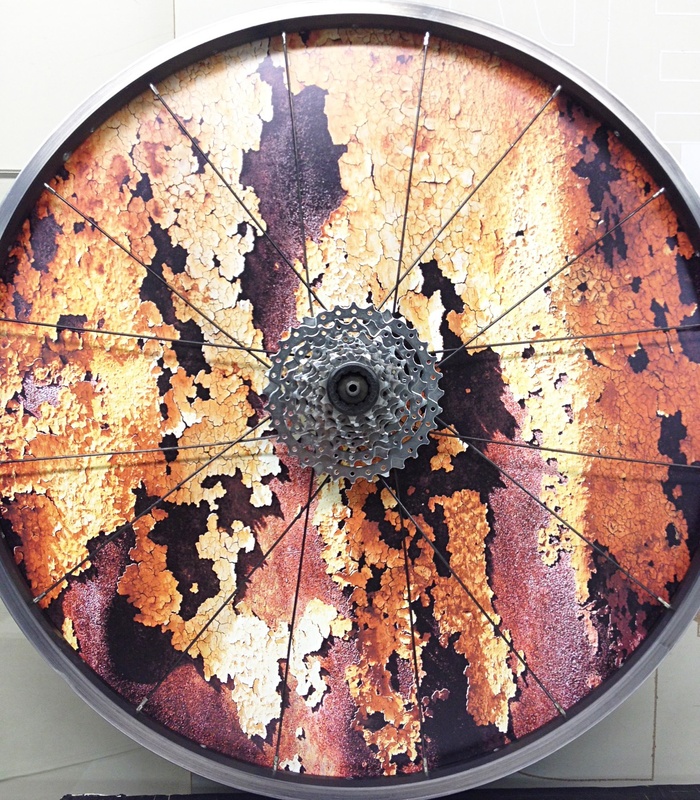 Since each wheel is recycled, the most challenging part was getting them cleaned up. The 'deconstruction' phase of production - where I cut off half the spokes and through the hub - was pretty straightforward and done at the Bamboo Bike Studio in Kensington Market. Zef loaned me his tools and allowed me to store wheels at his space as I collected them. Having a studio to do most of the dirty work in was really important! What do you see as the intersection between bike culture and the arts in Toronto and how do they relate for you as a photographer? This project is a full-on mashup of my two loves - photography and bicycles. I think the intersection of bikes and art is any intersection in the city - Toronto is full of artists and creative types. Artists are often practical and thrifty and busy, so bikes are a natural fit. Bicycles are also one of the best ways to explore a city and to find inspiration. What are you working on next with your photography? I'll continue to shoot for amazing magazines like dandyhorse, Momentum, and Precedent, and myriad clients who have special events or who need headshots. Creatively, I'm hoping to continue with this format for a little while - I'll be open to commissions, and am hoping to create new bike wheel framed pieces to show in Montreal, Vancouver and New York. Yvonne Bambrick’s Streets & Alleys runs June 19 – 23 at Hashtag Gallery (801 Dundas Street West), with an opening reception on Thursday, June 20, 6:30 p.m. – 10 p.m.